The flexi-card is signed off on each visit; it has no expiry date and can be used at any class. A Yoga-is "Flexi-Card" makes a wonderful present for Birthdays, Christmas and Anniversaries or just because you Love someone. If you attend classes regularly you can buy 5, 10 or 20 lessons and have a flexi-card which is signed each time you attend. There is no expiry date so you can take as long as you wish to complete the card. Should you miss your regular class you may attend any other class where there is an available space. No need to bring money to the studio. You don't lose out when you go on holiday or go off sick. 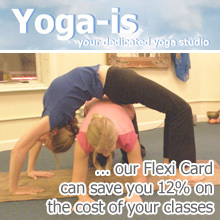 All students and flexi-cards are entered into a free draw which takes place twice a year where you can win some yoga equipment, as an additional way of saying thank you for choosing the Yoga-is Studio for your Yoga practice.